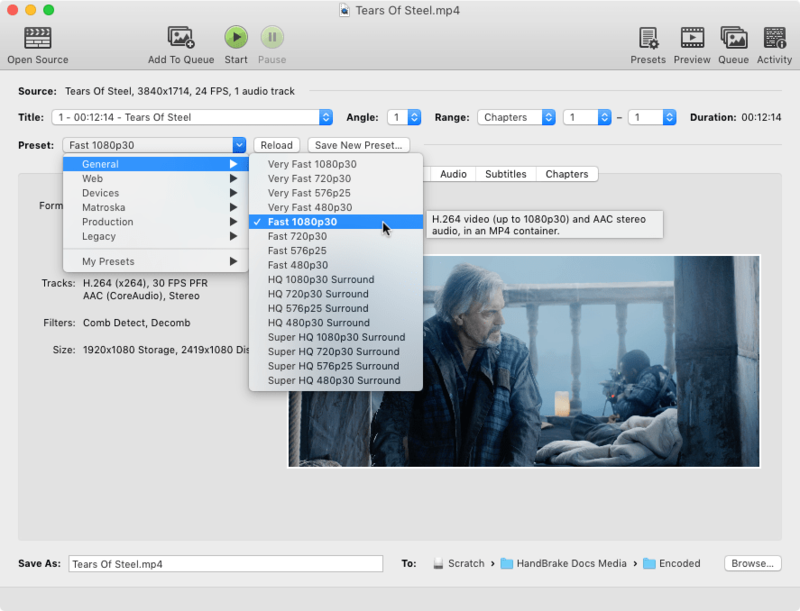 HandBrake includes a number of official Presets for specific devices and for general use. Once you’ve opened a Source, select the Preset that most closely describes the device you want your videos to work on. For instance, if you want to play your videos on a Roku that supports 1080p High Definition, choose the Roku 1080p30 Surround preset under Devices. See the technical documentation for more information about official presets. Presets are one-click settings to save you time and help ensure compatibility with your devices. If your device is not listed, or you wish to play your videos on a computer, the default Fast 1080p30 preset is a good choice. It’s fast and compatible across a wide range of software and devices. If you’ve previously saved one of your own Presets, you may select it in the same way as the official Presets. You can learn more about Custom presets in the advanced features section.